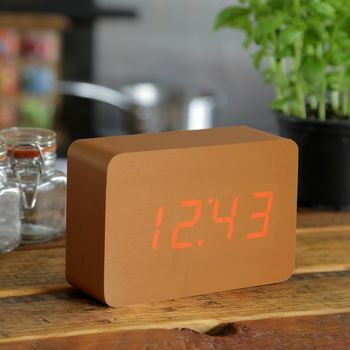 We're all slaves to time, but it's now on your terms with this Brick Copper-effect Click Clock. We think it's the perfect, unique and clever home accessory, especially if you don't like a bright light shining in your bedroom at night. But if you need to check the time in the middle of the night or early in the morning, you can just give a gentle tap to your bedside table and the time will appear. No longer does your room have to be illuminated by a constant blinking digital glow, nor do you have to fumble to find your smartphone in the darkness anymore. Best of all, with its PORTABLE feature with built-in RECHARGEABLE lithium batterry, it can be placed wherever you like. The bedroom is not the only place to put it.. Showing it off in your living room, kitchen (if you would like to) or anywhere else won't be an issue now! Plus, it has all the regular alarm and snooze features, so it could be your best alarm clock ever. This product is dispatched to you by Gingko.